Shelf life or validity period is the length of time that a commodity may be stored without becoming unfit for use, consumption, or sale. It applies to cosmetics, foods and beverages, medicines, pharmaceutical drugs, chemicals, tires, batteries, and many other items. Information about dates on pre-packaged food or drugs is a valuable source of information for consumers. A basic understanding of what terms are used can help you to better understand these labels. Millions of consumers experience the confusion of product dating. One package might have a "sell by" date, another a "best before" date, and yet another, a "use by" date. 1-Sell by. Don't buy the product after this date. This is the "expiration date." However it will still be edible beyond this date as long as it was stored properly. For example, milk might lose quality after the "sell by" date, but it should still be good 7 days past the date. 2- Best before. Flavor or quality is best by this date but the product is still edible thereafter. The product will be at its peak quality and taste until this date. "Best before" has nothing to do with the safety of the product and you do not need to purchase the product by this date. 3-Use by. According to the manufacturer of the product, this is the last date that the product will be at peak quality. Once again, it has nothing to do with safety. 4- Expiration. The last date the product should be consumed. Most expiration dates are used as guidelines based on normal and expected handling and exposure to temperature. Use prior to the expiration date does not guarantee the safety of a food or drug, and a product is not necessarily dangerous or ineffective after the expiration date. They don't mean as much as many people think they do. Most food is still edible after the expiration date but may not be very tasty. The quality characteristics of foods (taste, aroma and appearance) often depend in great part on good storage conditions: temperature and humidity control in the retail store and warehouse. The manufacturer that made that can is only going to warranty the actual can for so long. So even if the food inside the can might last three years, if the can manufacturer warranties that can for only two years, the product expiration date will be no more than two years. According to the USDA, "canned foods are safe indefinitely as long as they are not exposed to freezing temperatures, or temperatures above 90 °F (32.2° C). If the cans look ok, they are safe to use. Discard cans that are dented, rusted, or swollen. High-acid canned foods (tomatoes, fruits) will keep their best quality for 12 to 18 months; low-acid canned foods (meats, vegetables) for 2 to 5 years. 80 °F (27 °C). SEE THE TABLE FOR SHELF GUIDELINES AND STORAGE OF MOST CONSUMED FOODS . Drug manufacturers have economic and liability incentives to specify shorter shelf lives so that consumers are encouraged to discard and repurchase products. A study conducted by the U.S. Food and Drug Administration covered over 100 drugs, prescription and over-the-counter. The study showed that about 90% of them were safe and effective as long as 15 years past their expiration dates. With a handful of exceptions - notably nitroglycerin, insulin and some liquid antibiotics - most expired drugs are probably effective. 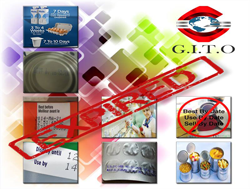 At G.I.T.O we look for the presentation of date marking on food packages and drugs, and test to assure the appropriateness of that date in accordance with the guidelines of food date marking issued by the FDA and other world health organizations.